The 2012 TCP Code requires a telco to have a compliant Complaint Handling Process and a document that summarises that process. There are special requirements for the Summary, too. At the Compliance Shop, we’re offering a template Summary that you can tweak a little if necessary and post to your website. ACMA made it clear from the start that complaint handling compliance was a not negotiable issue, and that its enforcement efforts would rapidly be directed to that area. The Authority made good on that promise, with a compliance drive that began in December 2012 and has continued into 2013. Service Provider websites are being inspected to detect whether a Complaint Handling Process is present and compliant with the 2012 Telecommunications Consumer Protections Code. If there’s a problem, the telco receives a letter that not only calls for compliance but asks probing questions about recent complaints performance. Publishing a compliant Complaint Handling Process summary isn’t a complete compliance solution. You need to ‘live it out’ as well. But if you want to minimise the amount of ACMA attention you get, at least having the right documents on your website is a smart idea. 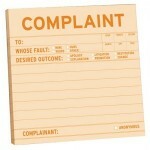 This entry was posted in Complaint Handling and tagged complaint handling, complaints, template. Bookmark the permalink.